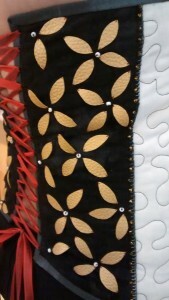 Back pleather flowers with white bead centers. 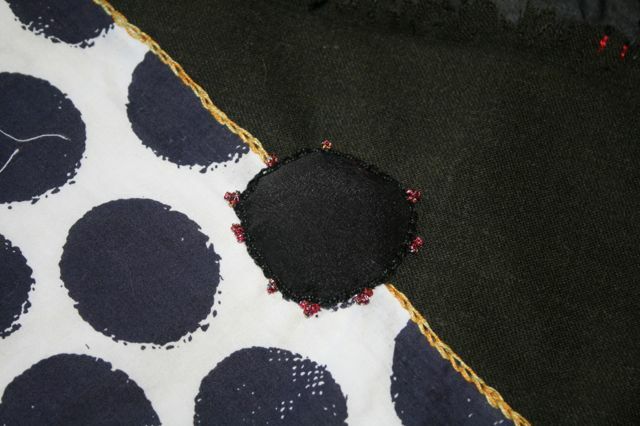 Tiny gold beads and buttonhole lace along each seam. Open faux front with lazy daisy flowers with black bead button centers. Full back with shiny, red ribbon. 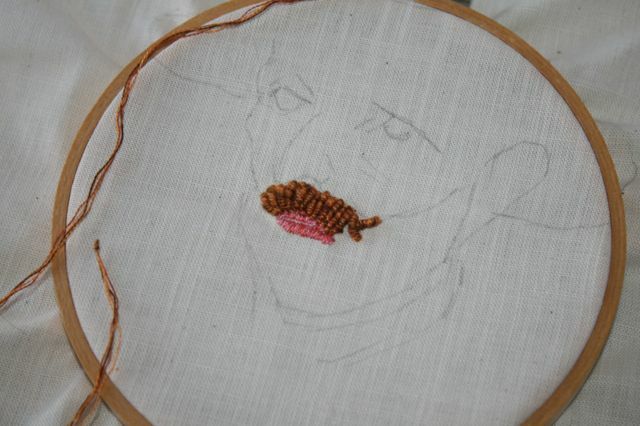 I am making steady progress on Van Gogh’s face. He is filling in nicely. 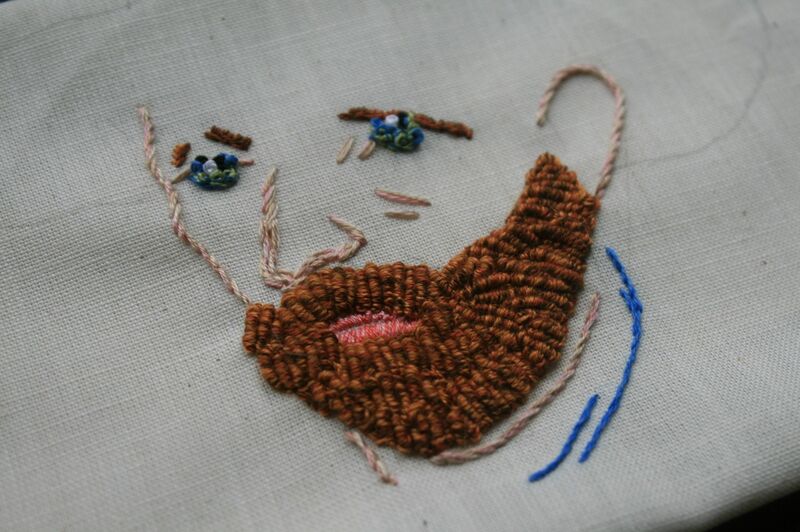 I used bullion knots for his beard, satin stitch for his lips, stem stitch and straight stitch for his facial features and shirt, and I used french knots for his eyes. In all cases, I used a variety of floss colors. I used one strand from the different colors to achieve the desired effect. His beard is a great example. I used five different thread colors. The whole piece will need to be damp stretched after I finish working it. 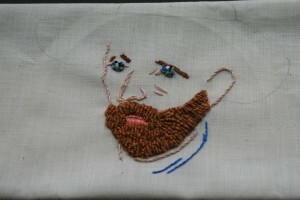 I need to work on his hat next, which will be wool with embroidery to define lines and edges. 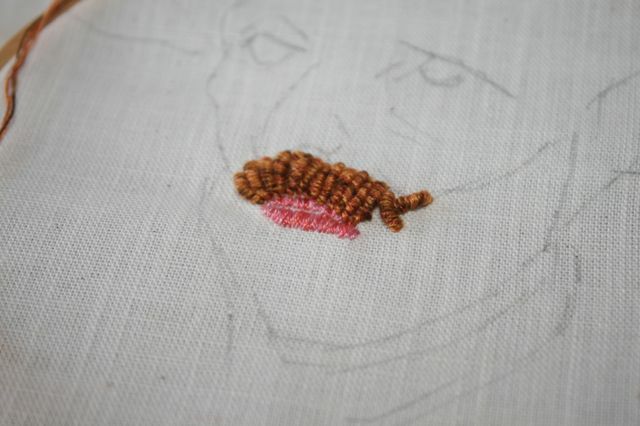 Bullion knots for his mustache with satin stitched lips. A closer image of the work thus far. My madness panel…series…has expanded. I have begun a genius panel, and I am sketching ideas for individual artist panels…Virginia Woolf and Van Gogh right now. I started a piece of the Van Gogh panel, which will include things like a bird nest, sunflowers, swirling sky, a tree and words. He was a prolific letter writer, so I want to pay homage to his love of words and his often wise commentary. I want to also include the melancholy Vincent, and I am working on what should represent that part of him. I have been working on my Madness panel, and I think I am making slow, but good progress. I finally finished embellishing my “mask” free-machine embroidered piece, and I found the perfect spot for it on the Madness panel. I also have more photos of the embroidery I have been doing elsewhere on the piece. I have a lot left to do…I am currently contemplating lips…lips to represent the voices some artists, like Virginia Woolf, hear that drive or hinder their work. 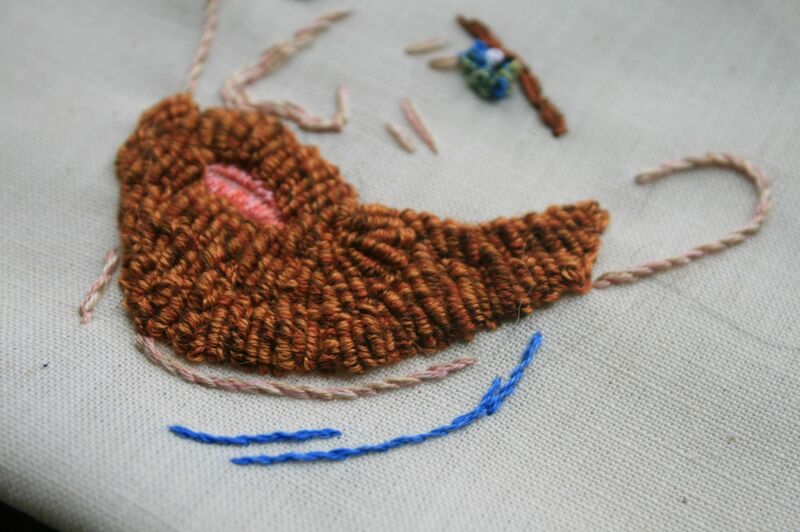 The “mask” piece with French knots, bullion knots, and button hole lace. 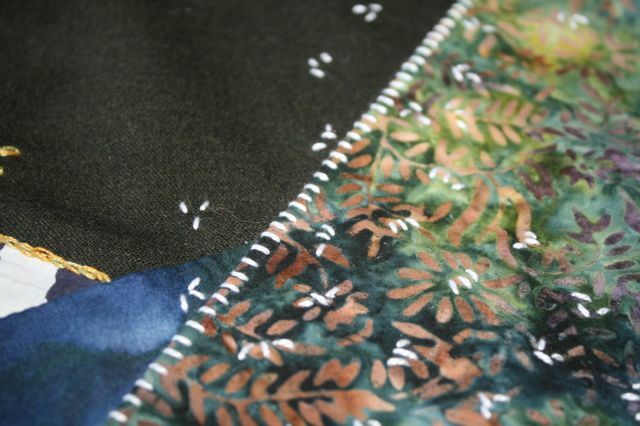 A lovely seam with bullion knots and French knots. 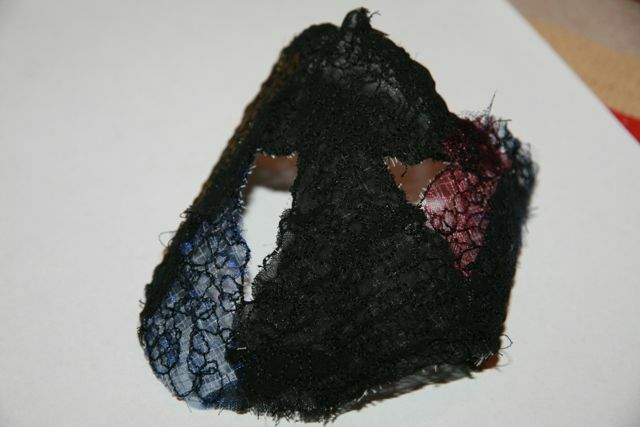 You can just see the web stitches peaking out from under one of the free floating seams. 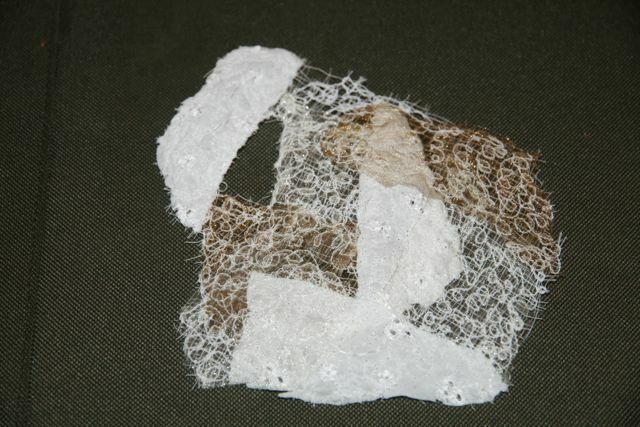 A small, stuffed applique with metallic French knots on the chain stitched seam. One of my favorite seams. Tiny stab stitches that seemingly are all around. 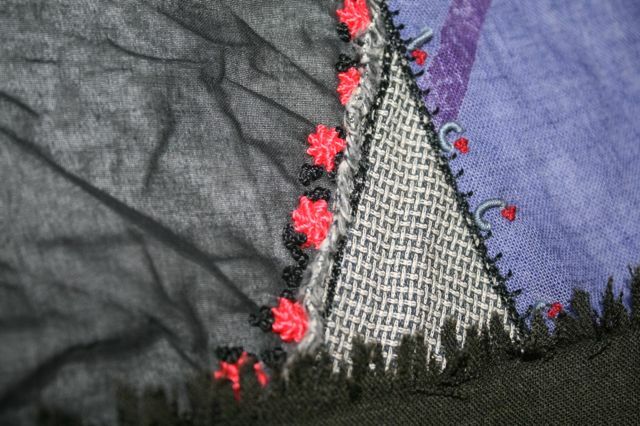 A better view of those web stitches with black French knots, too. I spent some time the other day looking up madness, lunacy, and hysteria…hysteria because part of Virginia Woolf’s condition has been attributed to her womanhood, and women over time have been seen as more susceptible to flights of fancy or emotional over-reaction. I used the OED…which I still need to photograph for you. I love the OED because it offers actual uses of words over centuries gleaned from tireless research and reading; it is my kind of dictionary! The madness definition is standard, but I did find part of the definition thought provoking, as I often do when seeking clarification for a word to which I think I already know the meaning. (Denotation often helps sift through connotation or to explain connotation.) In the madness definition I found the phrase “out of one’s mind.” Out of one’s mind…genius…the mind…thoughts…freedom of thoughts…potential…isn’t genius out of the ordinary use of the mind? I really like the implications of this phrase in relationship to how I think about the symbiosis of madness and genius in certain artists. Genius is fascinating. The first definition discusses a “tutelary god” or “attendant spirit” that helps govern a person and his/her abilities. (What if madness is a sort of attendant spirit for some artists?) The fourth definition is more common…exceptional intellectual power…but the clarification at the end is interesting, too. The clarification says that genius is often “contrasted with talent.” So I looked up talent…which suggests natural ability–either physical or mental. Again, nuance in meaning helping me to think about the implications of each word. Hysteria is common, too…excess of emotion or unhealthy emotion. I didn’t find anything unusual…but again I think it is helping me to better focus my thoughts and my work. 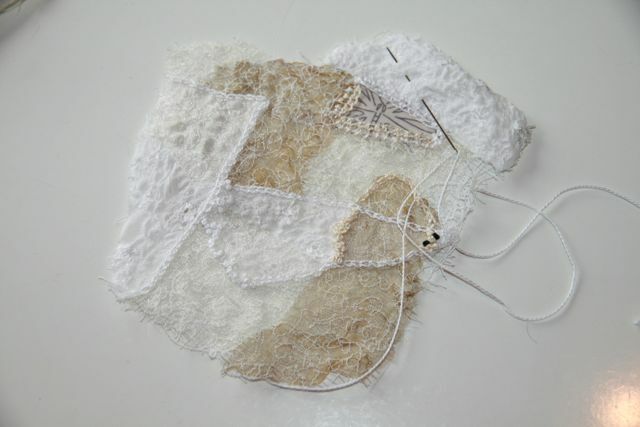 Beyond my definitions, I have been thinking about surface textures for my madness piece, and I realized I want to add applique, FME, cording, and couching. I may have said before that I want the surface to be throbbing, pulsing, and varied…such as I imagine madness to be and how I see it manifest in Vincent Van Gogh, Virginia Woolf, and perhaps Sylvia Plath. A larger piece of FME for my madness piece. I will definitely be using this one…I love eyes in it. 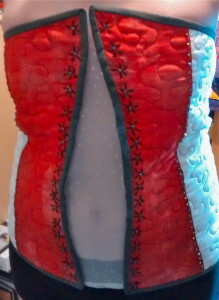 Another view of the same piece…I need to get busy embellishing it! I have been working on my quilt made from my block party blocks I won last month at guild! 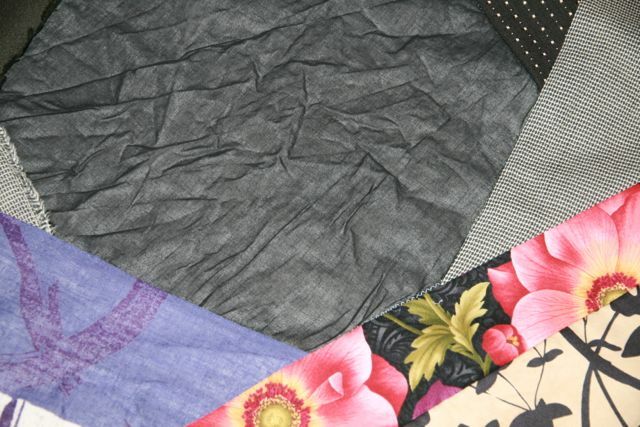 I decided to square up each block and sew them together instead of using sashing. 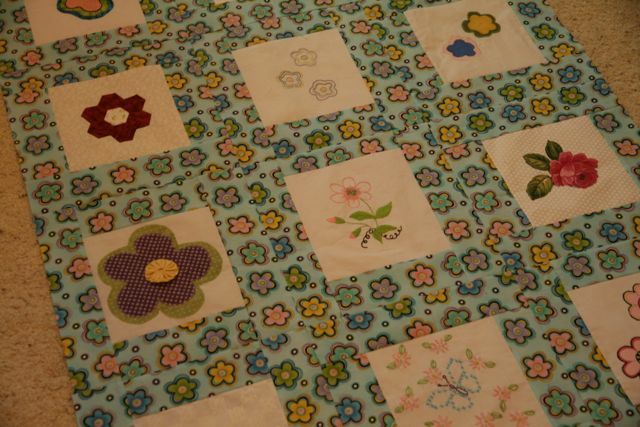 I like how the applique/embroidery blocks seem to float in a sea of flowers this way. 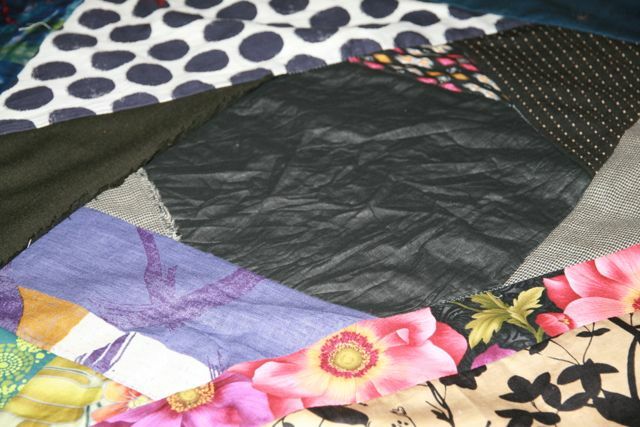 I have chosen a soft purple for the inner border and a deep blue for the outer border. I found a lovely floral flannel for the back! I’ll post more pictures as I get further along in the process. 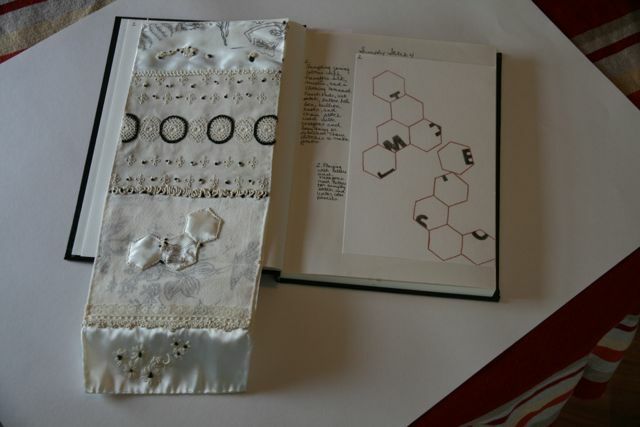 I worked on my ledger/sketchbook…I think it is really both since it catalogues my samples and has art ideas in it! I created a few pages, and I have more to do, but I am hoping by going through this process I will maintain the evidence of my work, spark ideas, and organize myself. I also have fun definitions for madness, genius, and hysteria…I spent time with my OED…I should post pictures of it, too! More on definitions in a few days. 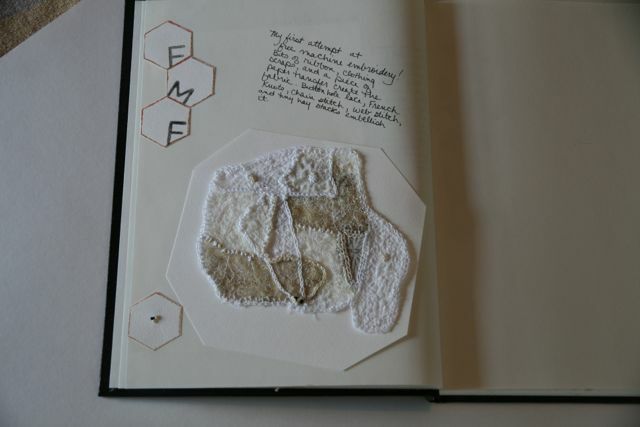 FME (Free Machine Embroidery) page from ledger…sample from Simply Stitch 4 with Karen Ruane. 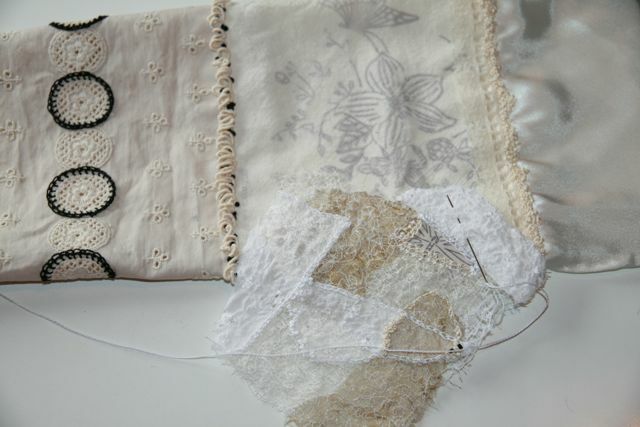 Ledger pages with samples from Simply Stitch 4 with Karen Ruane. Block party blocks becoming a quilt! I took a week off for Spring Break, but I have, by no means, been fallow! I have been thinking and writing more about madness and genius, most specifically related to Vincent Van Gogh, Virginia Woolf, and Sylvia Plath. I read Van Gogh: The Life by Steven Naifeh and Gregory White Smith last year, and I continue to be drawn back to it. The text is thorough and beautifully written, and Van Gogh himself is a lovely study because he, too, loves words. This text also encourages my questions about genius and madness and their odd, often sad, symbiotic nature. Naifeh and Smith argue that Van Gogh suffers from a form of epilepsy, but they also highlight his generally odd nature. From a very early age he retreats from society mostly because people pick up on his lack of social grace. He would love nothing more than to be accepted by others, but too often he finds himself ridiculed instead. So his loneliness and isolation shape him as a person, while his illness grows to the point where he is hospitalized. Throughout his life he encounters terrible spells in which he eats paint and behaves like a lunatic. Famously he even cuts off part of his ear, but the treatment of that incident in the biography is more a spell of melancholy and desperation rather than all out madness. Pondering all of this information and what I know about Virginia Woolf–a brilliant mind that heard voices,which are finally silenced by suicidal drowning–I wonder about the relationship between the artistic, superior mind and the supposed madness. (I always recall Emily Dickenson’s admonishment that “Much madness is divinest sense to a discerning eye.”) I do not think either Woolf or Van Gogh would be the artist they are without the consternation of their brains and hearts, however sad that may seem. I read more about Woolf and, of course, found the woman question…did she suffer because she wanted children? Is she ahead of her time and ultimately constrained by society? I need to read more, and I have several biographies along with her own diaries and essays in mind to read. Sylvia Plath, too, is fascinating, though I know the least about her. I plan to read The Bell Jar and more of her poetry…I’m sure a biography will creep in too…but I am well on my way in thinking about the cohesion of genius and madness. Free machine embroidery sample…I am going to have to make more. I will embroider this one and share that with you. Won’t they look lovely drawing together parts of the madness piece? Too, I think FME will help with the texture I am seeking in the panel! 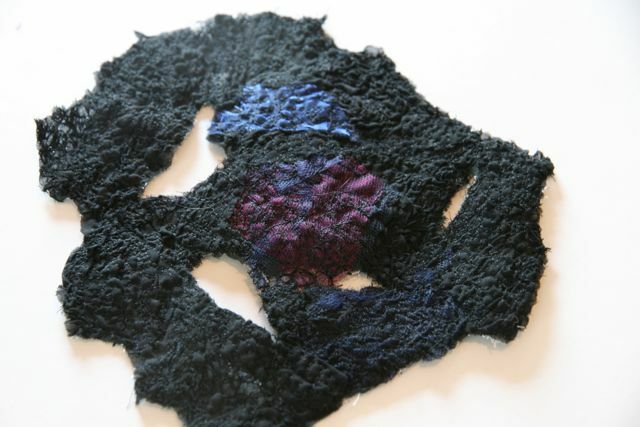 The black center and the surrounding cloth of the madness piece. A nearly full view of my madness panel awaiting embroidery. 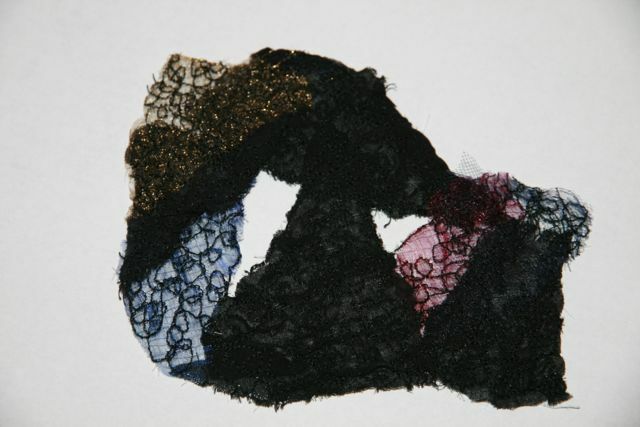 Another view of the sample piece of free machine embroidery for my madness piece. I am enamored with it! 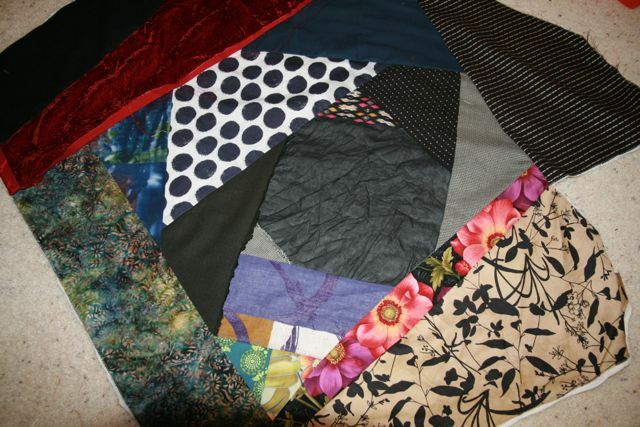 A view of the crazy quilt part of my madness panel…I am ready to start the embriodery! I have finished piecing the madness panel, so I am ready to titivate it, and I realized today that I have a desire to make it pretty in addition to evoking confusion, melancholy, and crisis. I believe the art that I love of Woolf and Van Gogh is a result of that perfidious relationship between genius and madness. The art makes me appreciate the madness, which I think they both despised. By the way, I have not allowed comments so far because I’m not sure I can keep up with them, but if you are reading and looking, and you want to comment on anything here, then please feel free to email me! Just click on the contact button at the top right of the page! I attempted FME or Free Machine Embroidery this week, and I really like it. I need to practice my machine stitches, but I love the laciness of it. 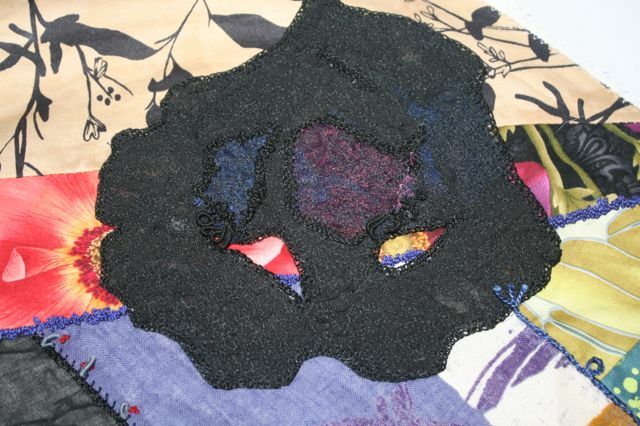 Too, I want to use some on my “Madness” panel, which I finished piecing this week as well. Now I have to begin the embellishments and words. I want to stencil and hand write words that convey my ideas of madness and the artists on whom I am focusing onto the piece, but I am going to sample some before I actually work on the cloth itself. 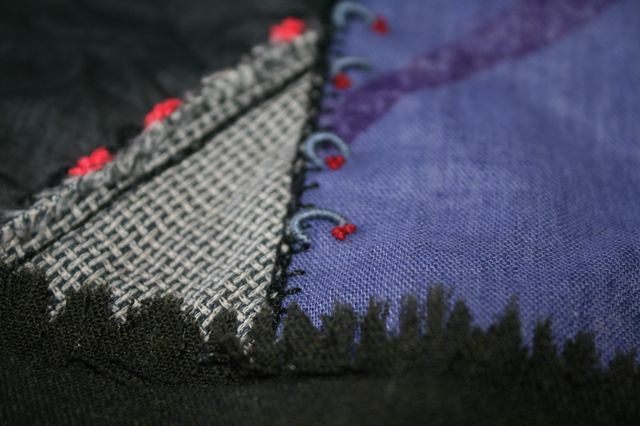 My madness piece is done in crazy quilt style with lots of dark and moody fabric. I left some seams ragged and open in a few places. I am pleased with the overall effect, and I am looking forward to adding elements to it. I should post some pictures of that process…next time perhaps. My FME with my panel I am working on for class. I think they live together nicely. Both need to be finished, though. FME partly embellished…more will happen this week! By the way, the little transfer peeping through is the paper transfer I used for the larger piece backed with interfacing. This little piece of FME will be a ledger sample. 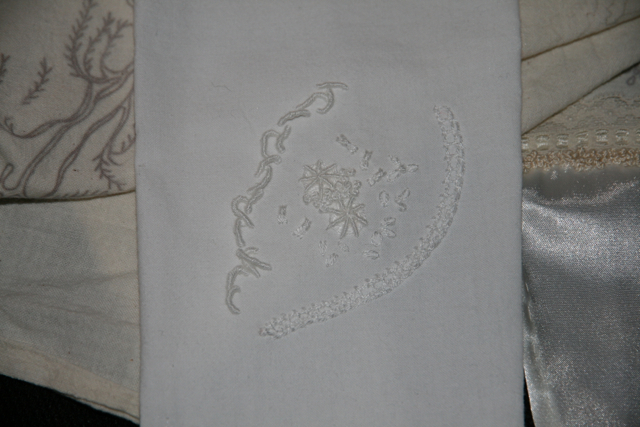 This piece is the reverse applique. 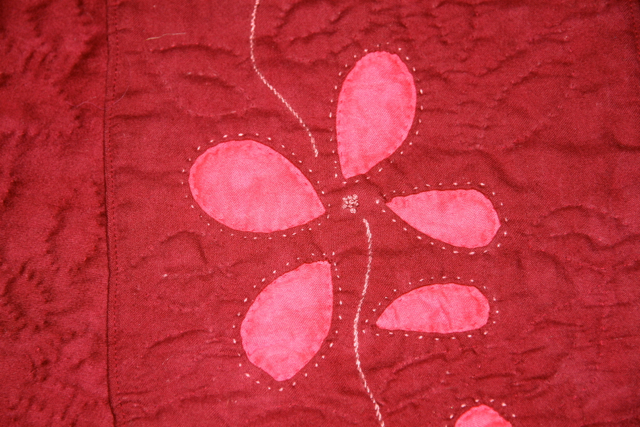 I reverse appliqued the flowers, used french knots for the centers and back or stem stitch for the stems. 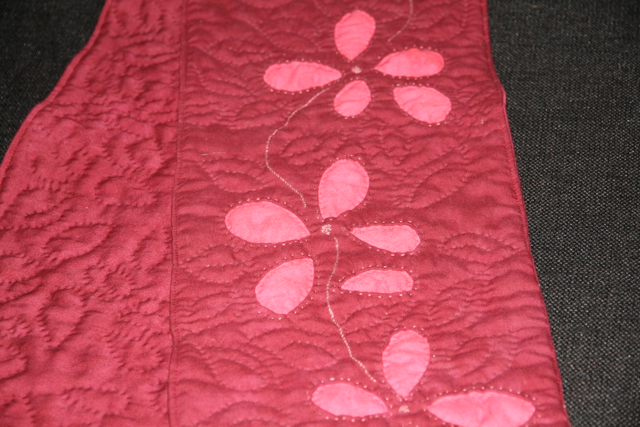 Then I hand quilted the leaves. 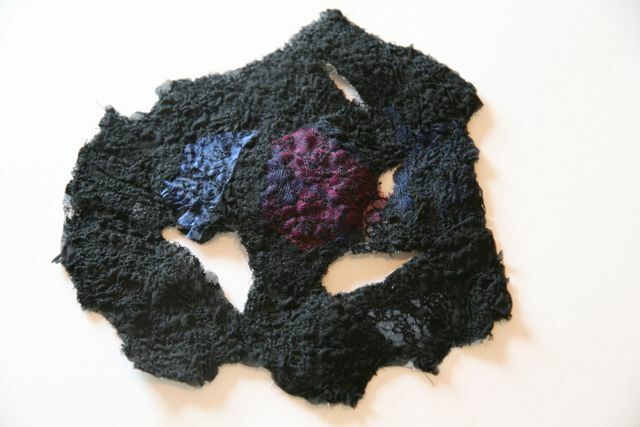 A sort of scarf that I really like, and I like reverse applique. I think I will try more! “Mermaid” is a recently completed project in which I experimented with fabric paint, organza ribbon, and machine quilting! I really enjoyed this tiny project, and I love the effect of the ribbon. I painted her first, and then I placed the ribbon and quilted over it to make her scales. "Wunsch's loose lower lip curled in amusement. Then, as if he suddenly remembered something, he spoke seriously. 'Nothing is far and nothing is near, if one desires. The world is little, people are little, human life is little. There is only one big thing--desire. And before it, when it is big, all is little. It brought Columbus across the sea in a little boat...'"
Ginger Cherry is powered by	WordPress 5.0.4 and delivered to you in 1.778 seconds using 43 queries.